What is the Surrey Integrated Musculoskeletal Service (iMSK)? How do I refer to the Surrey iMSK Service? ► What is the Surrey Integrated Musculoskeletal Service? 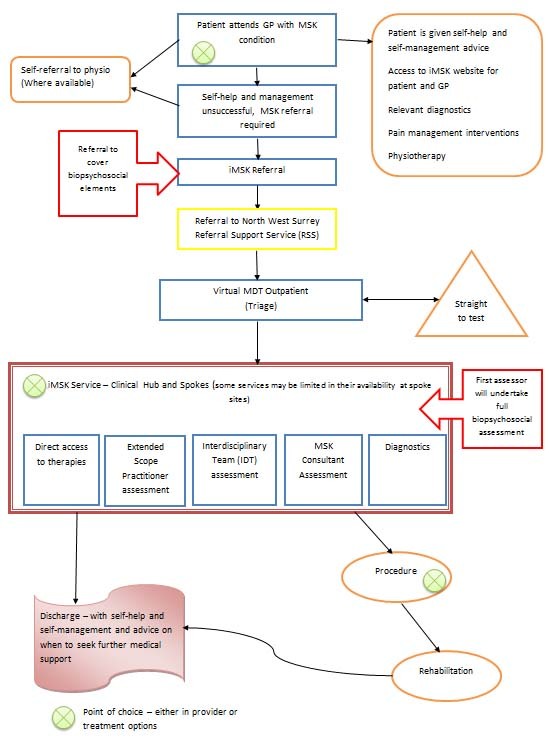 The Surrey iMSK service is a new integrated service that provides rapid, comprehensive MSK assessment and treatment services for all adult patients registered with a North West Surrey CCG GP Practice who have an MSK condition requiring specialist assessment and management including hand therapy and physiotherapy. The service will include triage within 48 hours of the service receiving the referral and first contact with the service within a 3 week period. There will also be a dedicated helpline for advice and guidance on the services. ► How do I refer to the Surrey iMSK Service? ► What happens when a referral is received? The quality of the triage depends on the information submitted on the iMSK Referral Form. Please give as complete a biopsychosocial account of the presenting complaint as possible, and include investigations already done and therapies already tried. The triage will take place within 48 hours and first contact with the service within a 3 week period and may include any of the below management options. The service will provide a range of information and support to promote self-management of common MSK conditions. The aim will be that patients can access this information at any time. The primary route will be via this website. Please add a link to this website on your own practice website if possible. This site will be continuously reviewed and updated to ensure that it contains resources and advice for patients and their families. These sites will provide a full range of outpatient services and diagnostics and where required in-patient procedures (dependant on the procedure required). Further services will be provided at ‘spoke’ sites. These sites will not have all the services offered at the hubs but will provide outpatient assessment and treatment appropriate to the venues. The number and sites will change to meet the demand for the service. For further information on the sites please see the Surrey iMSK website. In line with the NHS constitution patients will be offered choice of provider if a secondary care consultant assessment is required. PLEASE NOTE THAT ALL REFERRALS SHOULD BE SENT VIA THE NORTH WEST RSS. The referral will still be required to go through triage and then the referral will be forwarded to the chosen provider. Choice will be offered at all stages along the pathway to allow patients to choose the most suitable times and venues. Choice also encompasses shared decision making with the patient being provided with comprehensive information about their treatment choices and options available to them. The Surrey iMSK service will promote a Biopsychosocial (BPS) model of care. The BPS model takes into account factors such as emotions, activities, sleep, work, cognition, medication and an individual’s social circumstances to support a patient-centred approach to care that aims to improve patient outcomes. The model will encourage patients to be active participants in their care working in collaboration with their healthcare professionals. Patients will be able to access self-management advice and support via the iMSK website at the earliest stage. The BPS model will be included at initial assessments and throughout the patient pathway. Tools used will be appropriate for the patient and repeated to assess effectiveness of interventions (e.g. EQ5D outcome measure). All staff will be trained in the use of this approach to care with the service aim to address ‘what matters to you’ not just ‘what is the matter with you’. GPs can order more leaflets by calling Charlotte Batchelor (our GP Liaison Co-Ordinator) on 01932 723940.